Arena match round time decreased from 2:00 minutes to 1:30 minutes. For a while now, most rounds played have been at the state where they are not close to running out of time before a player is eliminated. This change should increase the likelihood of the timer running out with everyone still alive, while the majority of matches should still see a player fall before the timer runs out. However, the threat of sudden death should become a lot more noticeable than before. It will also push teams more to engage earlier and work towards counteracting defensive playstyles centered heavily around denying the enemy team resources. Round timers for 1:30 minutes, 2:30 minutes, and 3 minutes added as alternatives to Private Game settings, with 1:30 minutes being the default. 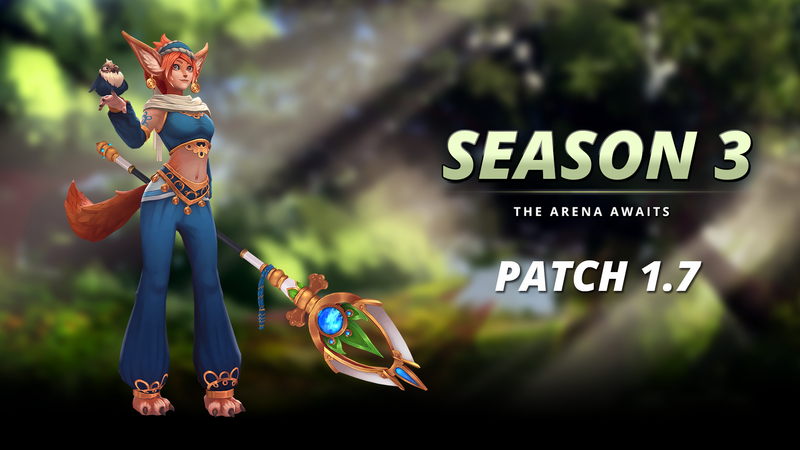 Season 2 Avatars will be rewarded depending on your placement for Season 2. The Top 5 in each region on the Leaderboards will receive a title for their placement. Season 3 starts on July 31st, and includes two completely new sponsors with a return of 4 of the previous sponsors, most of them brandishing new rewards. If you are still signed with a sponsor from Season 2 you will still be able to complete them. All sponsors from Season 2 will be marked with a star. Prehistoric Items and Ancient Chests will return with the start of Season 3. Ancient Chests will be purchasable for 250 gems apiece. Purchase five at a time to get a sixth Ancient Chest free, or 15 at once to get 5 free as well! These chests contain 3 random drops and guarantee one non-duplicate Epic or Legendary prehistoric item. Owning all items results in duplicate items. Within them a new Legendary Outfit for Croak can be found – the Saurian Tribal Warrior. The Champion’s Glider, a new Legendary Mount, has been added to Pro League Chests. Obtain Pro League Chest by purchasing them through Twitch Commerce. The theme of this patch is making broader changes to general systems and mechanics in the Arena. While there are still quite a few tweaks to individual champions, the emphasis is to see the state of the game after players adapt to the larger changes to the game. The main approach for the Champion changes this patch has been to address a few of the current outliers and look at rites that were either in need of being toned down, or rites that were not far from a more pickable level. A few more noticeable mechanic or battlerite tweaks to individual champions have also been made. Cooldown reduction on healing abilities bound to M2 is now based on the amount of total living players, as opposed to the amount of living allies within range. Range is now global instead of a 15 distance unit radius. Individual base cooldowns and reductions are listed below. As the total number of players is reduced, the total amount of healing resources will be reduced for both teams (supports with M1 heals being exceptions). As a result damage will become more difficult to negate for both teams as players fall, while at the same time eliminating the cooldown disadvantage a team with fewer members remaining is currently at. The result will be that matches where an advantage has been established will end quicker in general, but also that disadvantaged teams will still be able to heal at an equal footing with the team in the lead. Different Weaken effects now no longer stack in such a way that two 50% reductions result in a total 100% reduction. Instead two 50% Weaken effects will now result in a total 75% reduction (50% of the original value, and then 50% of the new value). As our roster has grown so has the amount of tools that provide Weaken or Weaken-like effects, and in general we feel that Weaken stacking with the current system may not result in the most healthy gameplay. With this change Weaken stacking will become less overbearing, while still being a tool that can be utilized in powerful ways. Incapacitated targets will now break free from the Incapacitate when they take damage, even if they are shielded and the shield absorbs all of the damage. This eliminates weird situations where people farm energy or weapon charges on incapacitated targets while they are shielded. Bakko sees some power shuffled around in The Red Axe rite to emphasize building up more weapon charges, along with some of his less popular rites getting boosts. Destiny’s Charge Bolt has the unique properties of having a variable cast time while inflicting a spellblock. She applies notable pressure to bait out defensive moves during the entire cast time, and even when used as an immediate interrupt it yields a long Silence. We are tweaking that aspect of the ability, forcing Destiny to pay more attention to the timing of her Charged Bolt in order to get the most value out of the Silence. Some of her strength against ranged champions will also be tempered due to the change to Plasma Wall, whereas the change to Plasma Accelerator is partly motivated by current technical limitations, but also makes her less oppressive against other champions that manipulate projectile speeds. Now increases maximum Silence Duration, as opposed to giving a flat 0.7s bonus duration. Jamila managed to rise to prominence as aspects of her eventually became a bit over the top. Some of the raw output in her core kit will see adjustment along with toning down her most powerful rites. Along with this she gets tweaks to Stalking Phantom to increase the number of situations where it is useful, while still retaining clear elements of counter play. The dash now triggers directional shields and counters. The subsequent attacks no longer trigger directional attacks, shields, and counters, instead they count as area attacks. After the dash: Damage per strike in each burst increased from 3 to 4, total amount of strikes reduced from 6 to 5 (total damage for each burst increased from 18 to 20). Now deals damage in a circle around itself, rather than in a cone in front of it. Hitting a target with Elusive Strike (Space) is now required to gain the recast, however as long as at least one target is successfully hit in the last dash, the recast will be granted. More champions will now have a window where they can escape from Raigon’s Dragon Palm combos. The Riposte change means that there’s more to the mind game surrounding its use, as it is still vulnerable to counters and directional shields, but it does put Raigon in a more powerful position than before as there’s simply more options available to him. Amount of strikes increased from 14 to 15, putting the total damage after dashing from 84 to 90. Now works as a recast, where you can recast Parry for up to 1.8s. Stun duration in the tooltip now describes the total stun duration (0.6s) instead of stun duration per strike like before (which was 0.3s). The stun duration has not been increased. Shifu’s playstyle requires him to have tools to stick to his opponents. However, the rite Swift Feet did more than simply giving Shifu sticking factor, it also made it even more difficult to pin down the already slippery old man. With the removal of Swift Feet and the reintroduction of Skewer, he still has means to stick to opponents, without more mobility being added to his kit. Additionally, Shifu gains a new rite that enhances offensive usage of Fleetfoot. It will now be easier to notice Taya winding up an X-Strike. Her strong ability to dish out damage has been slightly toned down, and she won’t be quite as elusive while running around anymore. 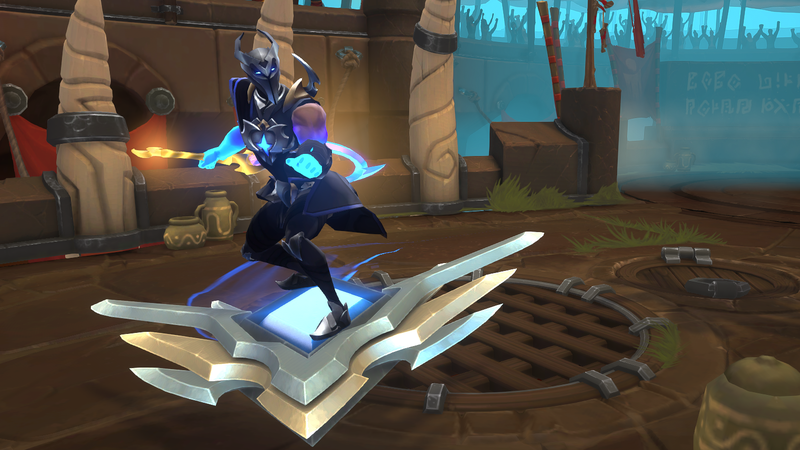 After Ulric’s release, we moved him towards a direction where he shines as he’s protecting his teammates but struggles more in protecting himself. While this weakness is intentional, the new Divine Abundance rite gives him a way to sustain himself as long as he continues to work hard on protecting his teammates.